« The Hits of Wham! 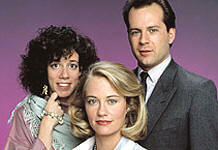 Running from 1985 to 1989, Moonlighting was a very unique show. It was an unusual mix of drama, comedy and romance, all delivered at a shotgun pace by its stars Cybill Shepherd and Bruce Willis, so you had to pay attention, as there were many scenes where both character were talking nineteen to the dozen and at the same time as each other. The back story was that Maddie Hayes (Shepherd), a former model, found herself in financial problems after being ripped off by her accountant. Whilst selling off her remaining assets she finds she owns a private detective agency run by David Addison (Willis). Addison manages to persuade her to not sell the business and instead become a full time partner instead, which she agrees to do, renaming the company the Blue Moon Detective Agency, a name which came from the shampoo for which she was famous for advertising. The partnership, for the most part, worked well, with the pair solving cases amid many a wise crack from Addison and a blossoming, but awkward, romance between the pair. One of the main reasons for the show being so unusual was that the characters in it quite often started addressing the audience directly, from a raised eyebrow or a knowing look to the camera to full blown dialogue addressing the viewers. Other bizarre things would also suddenly happen, like cast members suddenly leaving the set of a member of the production crew coming on to make an adjustment to the set. It seems strange that this could work, but work it did, and when it came to the final ever episode it was taken to its logical conclusion, with the last scenes being played out as the sets were deconstructed and the stars having to track down the director of the show to ask questions. Other regular characters were Agnes Dipesto (Allyce Beasley), the softly spoken receptionist who always answered the phone with a new rhyming slogan or phrase, and in later series Burt Viola (Curtis Armstrong), a clerk who dreamt of becoming a detective himself, and eventually did when Maddie and David started to appear less in the show. This last point is why the series suddenly faltered and began to die. Bruce Willis, for whom Moonlighting was his big break, had just made Die Hard and wanted to pursue a movie career (which was obviously the right move for him!) whilst Cybill Shepherd had become pregnant and wanted to concentrate more on her children than on a TV show. This meant that for the final series David and Maddie were barely around, and the detective agency was being run by Agnes and Burt, who whilst good characters weren’t the reason why you wanted to watch the show, and so viewing figures trailed off. 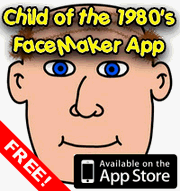 This entry is filed under TV - Miscellaneous	and was posted on September 6th, 2010. You can follow any responses to this entry through the RSS 2.0 feed. You can leave a response, or trackback from your own site. Booo! You picked a picture without Burt in it. My husband and I were talking about Moonlighting – he loved it, total fan. I never watched it because i wanted to be different to all the drooling fan girls in my form class. Now I feel like I missed out on a total cultural icon like Friends! I came a bit late to the Moonlighting party myself. I don’t think I started watching until around the third season, which I really enjoyed, only to then be disappointed when it went downhill in the fourth season with an almost total lack of Bruce Willis and Cybill Shepherd.